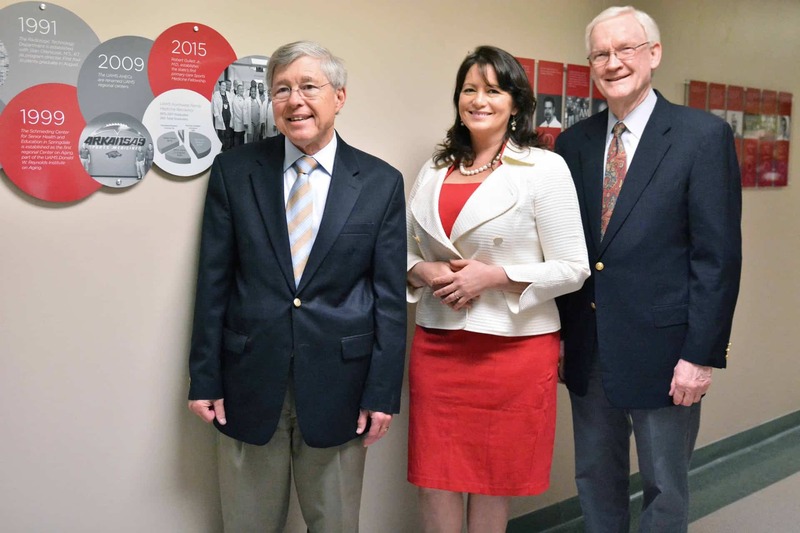 Bob Gullett, M.D., Pearl McElfish, Ph.D., M.B.A., and Peter O. Kohler, M.D., pose for a photo in front of the newly unveiled timeline celebrating 10 years of academic medicine at the UAMS Northwest Regional Campus in Fayetteville. Nov. 17, 2017 | Nov. 17, 2017 | Celebrating 10 years as northwest Arkansas’ home to academic medicine, the University of Arkansas for Medical Sciences (UAMS) Northwest Regional Campus hosted community leaders, friends, faculty and staff today for a timeline unveiling and open house. About 150 members of the public joined McElfish, community leaders, former faculty and other campus leadership in the lobby of the Fayetteville building for the event. Guests listen as Peter O. Kohler, M.D., distinguished professor, shows off the timeline unveiled during an open house at the UAMS Northwest Regional Campus Fayetteville building on Friday, Nov. 17. The timeline is located in the Fayetteville building, near the Regional Campus Conference Room. It starts in 2007 and includes key dates in campus history extending to the present day. In 2007, UAMS made a commitment to academic medicine in northwest Arkansas with the introduction of a regional campus. Peter O. Kohler, M.D., distinguished professor of internal medicine in the UAMS College of Medicine, was named vice chancellor and set about building an interprofessional medical education opportunity that also supports the community through research and clinical services. The UAMS College of Pharmacy appointed Eric Schneider, Pharm.D., associate dean of the Northwest Regional Campus in 2009. 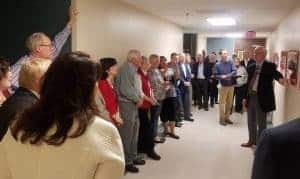 Six third-year medical students came to campus that summer, starting their time on campus with a wall-breaking ceremony to acknowledge the major renovations to come. They graduated in May 2011. Chris Smith, M.D., was appointed the first regional dean for the College of Medicine that year. The College of Pharmacy also welcomed its first class of third-year students in 2011. The Northwest Regional Campus housed 107 students and 30 postgraduate medical residents at that time. In 2012, Bill Buron, Ph.D., R.N.C., was appointed the first assistant dean for the UAMS College of Nursing in the northwest region. The Pat and Willard Walker Student Clinical Education Center, where students simulate patient interactions, opened in 2013. In 2014, there was a flurry of activity. John Jefferson, Ph.D., began as inaugural director of the Doctor of Physical Therapy program, which was championed by area leaders. The Northwest Regional Campus is the sole home of the UAMS Physical Therapy program. The Outpatient Therapy Clinic, offering physical, occupational and speech therapy services to the public, opened in the fall. The North Street Clinic opened in late 2014, offering diabetes care to the local Marshallese community. Marshallese have some of the highest rates of diabetes in the world. Almost 200 students have worked in the clinic, learning about effective culturally appropriate patient care. The first internal medicine residents came to campus in 2015, bringing future medical professionals specializing in comprehensive adult primary care to the area. Inaugural doctor of physical therapy students arrived on campus that year as well. In late 2015, McElfish and Nia Aitaoto, Ph.D., M.P.H., founded the Center for Pacific Islander Health on campus to focus on health studies within the underrepresented population. It is the first in the continental United States to do so. McElfish and Aitaoto are both assistant professors of internal medicine in the College of Medicine. Sheldon Riklon, M.D., associate professor of family and preventive medicine in the College of Medicine, one of two practicing Marshallese physicians in the country, joined the staff and was invested as the first Peter O. Kohler, M.D., Distinguished Professorship in Health Disparities in 2016. At the end of that year, McElfish was appointed associate vice chancellor of the Northwest Regional Campus, succeeding Kohler. According to the Northwest Arkansas Council, 27 people have moved to the region each day since 2010. “We are uniquely poised to advance northwest Arkansas through community-based health care and by developing the next generation of leaders in the field,” said McElfish.